The names of apples make me happy. Here in Southern California I grow Pettingills and Gordons, Golden Dorsets and Winter Banana, Fuji, Granny Smith and a would-be Red Delicious which is neither. I instantly want to excuse myself– I, myself, would never have chosen to plant a Red Delicious, having picked up a mildly critical attitude towards it as a flavor-impaired, poorly textured waxy variety. It shows poor type characteristics, like the odd areas of translucency you sometimes discover near the core. My father, who knew the wonderful vast array of named varieties taught me here and there, even by accident, names and attitudes and stories. His father before him as the caretaker and lover of the Gowen apple orchards spreading generously under the New Hampshire skies, put in many experimental types, evaluating them over the years for inclusion in the different Gowen holdings spread across the lower right corner of New Hampshire. I remember walks that never reached the limits of those fields and orchards, bordered by capacious woodlands and swamps. I remember stopping by the Golden Delicious, discovering that, even frozen on the tree in winter, the withered speckled fruit tasted marvelous when you cracked off the ice, a sorbet of tangy sweetness with that overlay of caramel that marks a great Golden. I recall my delight in the Macoun, which of course we re-pronounced the ‘MacGowen’ to suit ourselves. One of my favorites with its purple-garnet skin dusted by frost, like someone cast a scatter of powdered sugar across. So white and juicy a flesh, crisp and breaking with a snap. Not too sweet, the Macoun had the flavor of November, I used to think. Not for cooking, ever. Only eaten cold off the tree. But for an all-around staple… oh you think I’m about to praise the Macintosh? Nope. They’re okay and they do have an interesting milky flavor, a touch musky, and a friendly attitude overall, and generous productivity, but–nope. It’s the Courtland. I have a short ode to the Courtland in one of my next books. 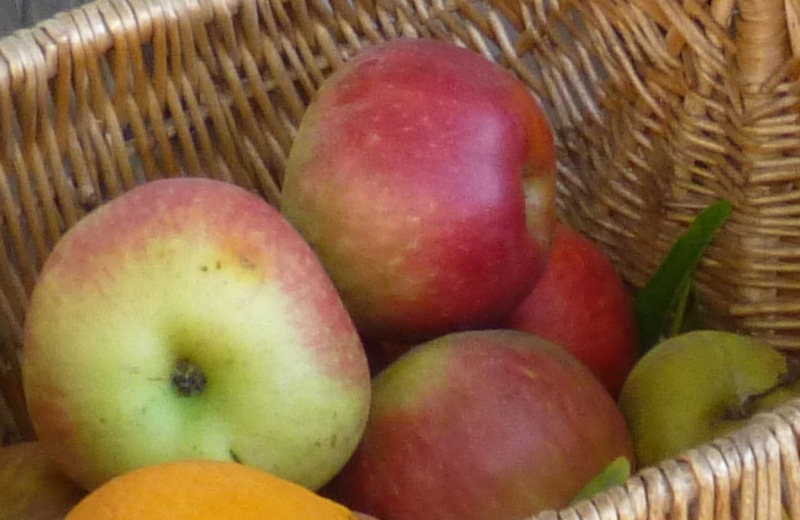 The best all-around apple, a great keeper with its waxy skin, quick to polish up into a gorgeous warm red streaked with autumn sun, bursting with juice and as good for a pie or applesauce as it is for eating out of hand. Big enough for a meal. Times have been, that’s what I used them for, but you have to wait for the book to know the context. What names the old apples carry. Bliss, Winesap, Johnathan, Sheep’s Nose, Baldwin, Pound Sweet, Arkansas Black. Names given with pride and love and anticipation. But I also I recall the unnamed wild ones that may have even dropped from Johnny Appleseed’s hand. I have wandered in October gloaming and scavenged ancient trees half-sprawled by the insults of harsh winters, leaning on the stubs of chimneys past. Households long scattered, shadow-haunted cellar holes clustered with leaf-shed lilacs. I have discovered little scabby fruit, some bitter, wormed, twisted, scrambled up the roughened bark, grabbing the contorted limbs. And every so often a sound rosy cheek turned to me, fragrance in the darkening afternoon, the bite of flavor, sweetness, all the more marvelous for the disappointments that came before. Both of these oil paintings date back many years. They also belong to the collectors of last post’s pieces, who let us house their paintings during the renovation of their home, and it has been a pleasure to have this opportunity to live once more with my older work. 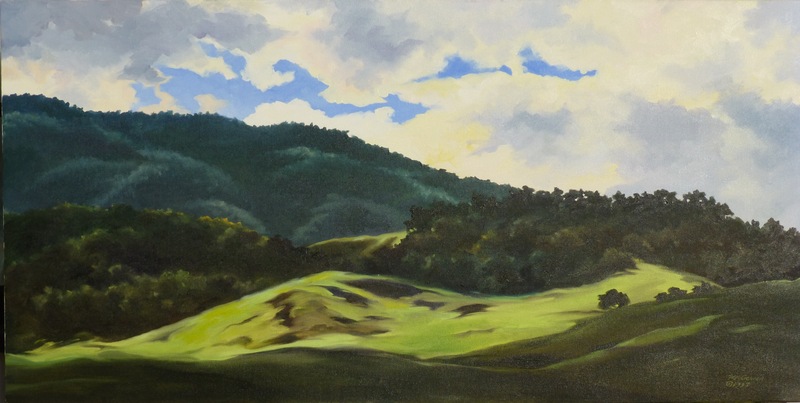 Of the painting The Tattered Hill, I remember staring at the rents in a green spring slope and wanting to paint them, fascinated by the sense that the cloth of grass had been torn. 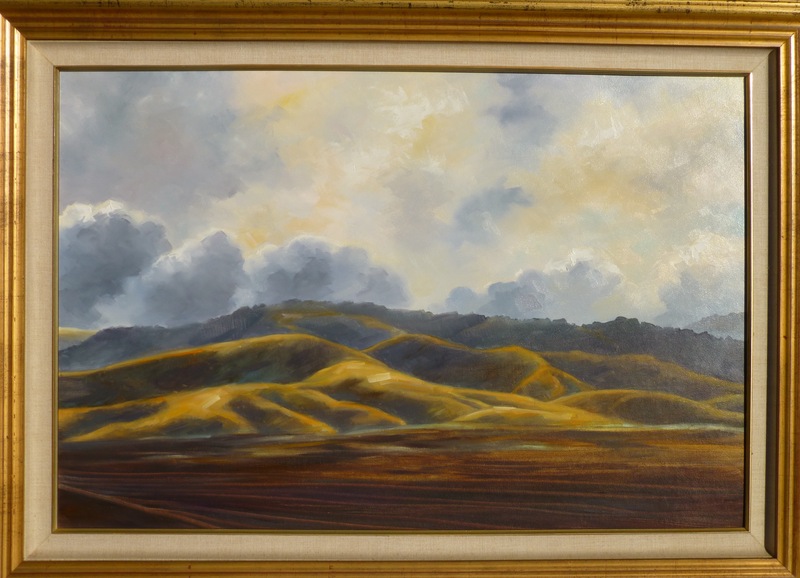 The Dark Hills Near Salinas came from a couple of high-speed highway sketches. I take a small blank book when we are driving and will make a gesture drawing as fast as I can when I see something that moves me, then scribble in as many color notes as I have time for. I have also been known to use the back of an envelope, or in some cases the gas receipt! Later I will sketch those bones of the painting onto a canvas or gessoed board and use memory and my color notes to build the painting. I do very little layering or glazing. There’s a freedom this kind of painting gives me, not so much detail that I am trapped into trying to copy reality, but a true sense of the authority and weight of the land in its shifting forms, and the motion of trees reaching, contending, racked between earth and sun.